What Colors Go with Red? Red has the power to evoke a multitude of emotions. Whatever your intent, red makes a statement in a big way. 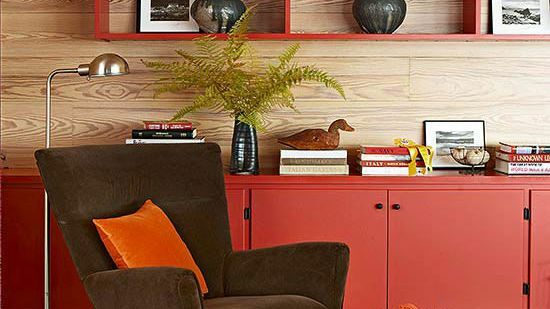 Take a tour of some of our favorite daring and delightful spaces all decorated in red. 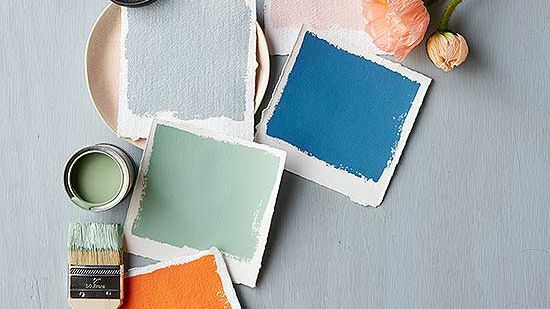 Plus, see what other colors to pair with this exciting shade. 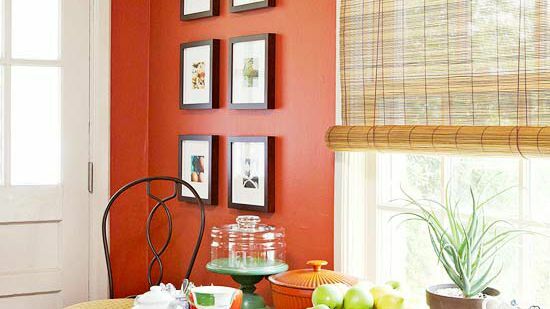 This fashion-inspired dining room evokes all the pomp and verve of Hollywood with bold, red walls. 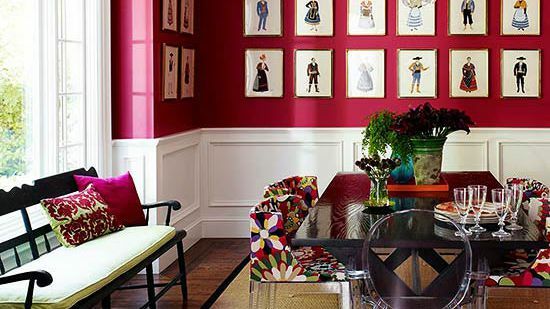 Bold, crimson walls are tempered by classic white wainscoting. A kaleidoscope of colorful prints enlivens four Lucite Ghost chairs. The sparkling chandelier is worthy of silver screen greats. Sophisticated fashion sketches filled with bold strokes of color hang across the rear wall as a grand focal point. 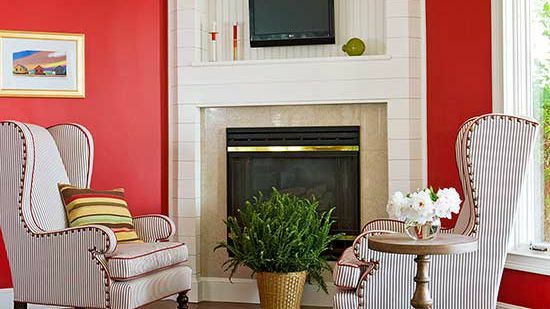 Bright red and bold patterns animate this living room. Walls seem freshly dipped in a candy coating. Wing chairs displaying vertical gray stripes are piped in red like a fine confection. Buffalo checks on the ottoman underscore the light-hearted mood. 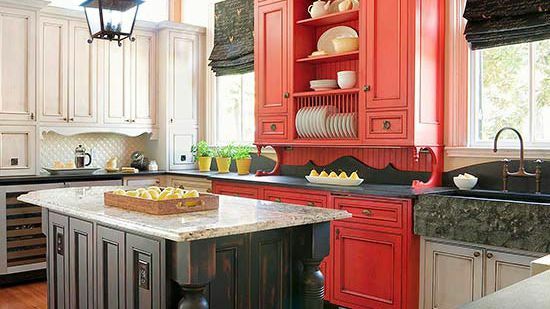 In the spirit of a little red schoolhouse, this kitchen oozes classic character with simple red-painted cabinetry and primary accent colors. The old-fashioned charm of a black-and-white tile floor and schoolhouse light, rimmed in red, enhances the cafeteria appeal. For a fun kick, yellow walls are the same color as a no. 2 pencil. 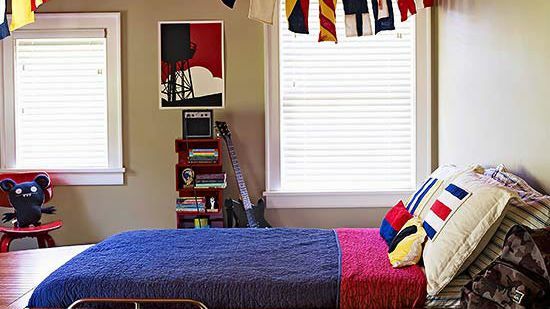 Nautical colors and a nautical theme combine in a bedroom fit for a young sailor. A navy coverlet tucks in, in the boat-shape bed. 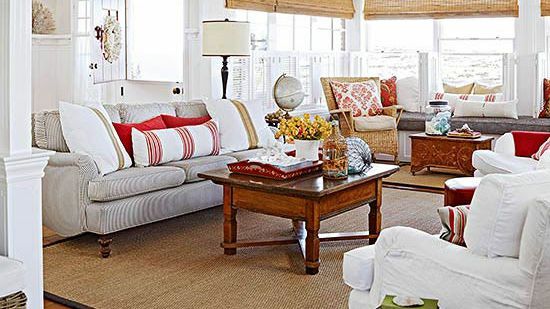 Nautical flags in a variety of primary-colored patterns stretch like a sail across the room. Red on the ceiling nods to the old good weather adage, "Red sky at night, sailor’s delight." 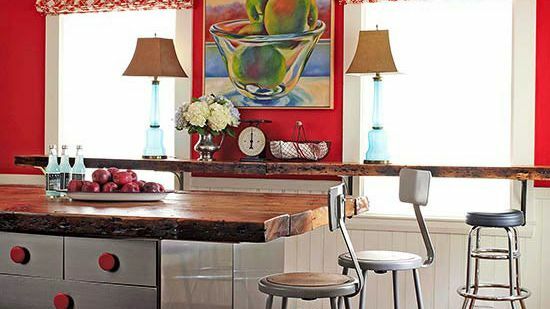 Proving that sometimes less is more, a rustic red island is all this kitchen needs to stand out. 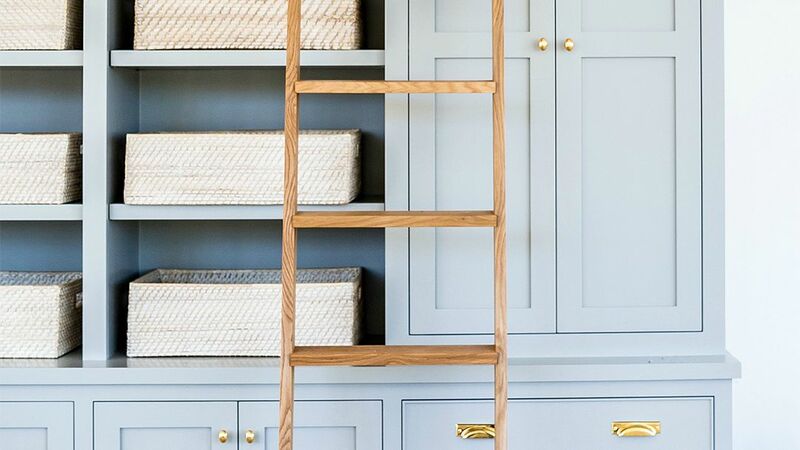 The island serves as a bold, but not overwhelming, focal point for the white walls and vintage-style hardware. 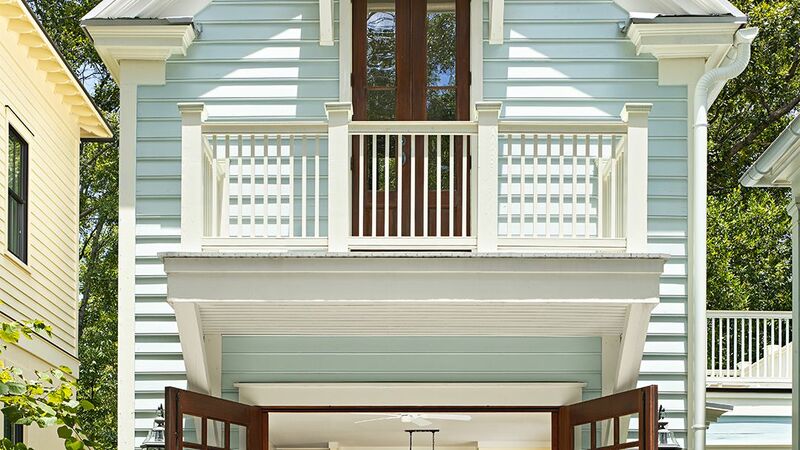 Two pendant lamps hang above the island, bringing the color all the attention it deserves. Dark floors recede keeping the focus on cabinetry. 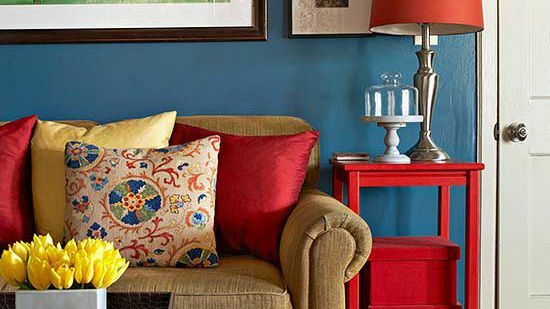 This living area plays to the three primary colors. 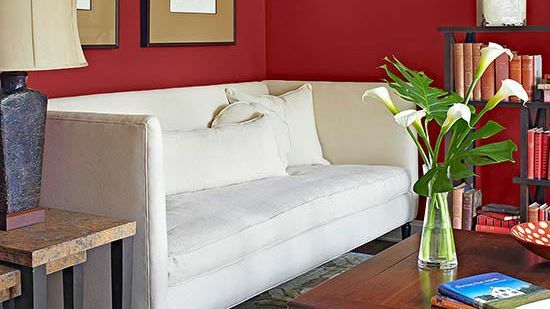 A red ottoman, side table, and accent pillows ground the room, pulling the eye from one area to another. 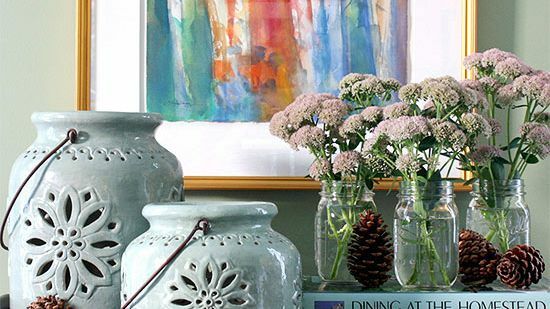 Blue walls offer a serene backdrop for the vibrant hue. 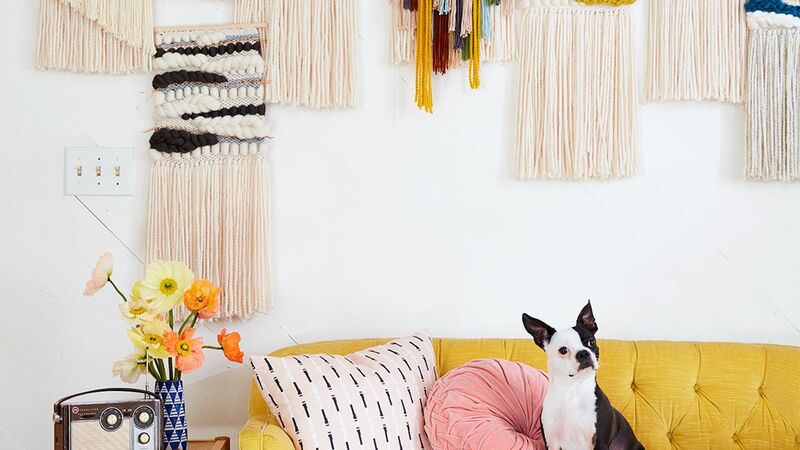 A pop of yellow in a throw pillow and floral arrangement adds a ray of sunshine. All three colors are balanced and harmonize thanks to a shared jewel-tone value. Terra-cotta tiles have long been a favorite surface for floors. 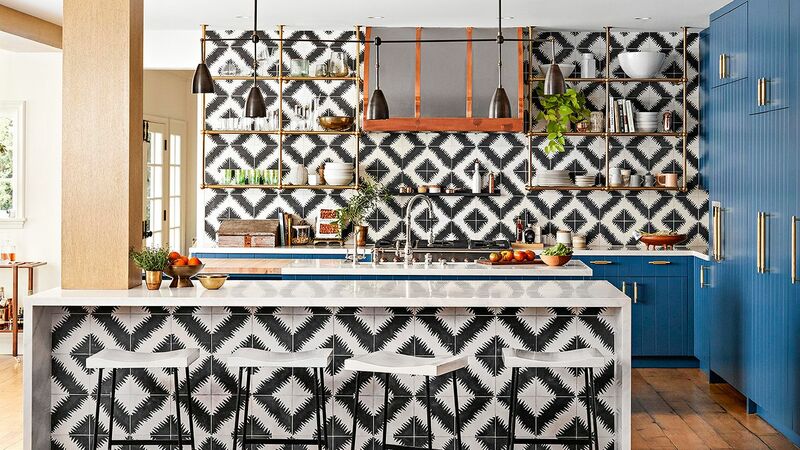 This kitchen takes the inviting hue to the walls. 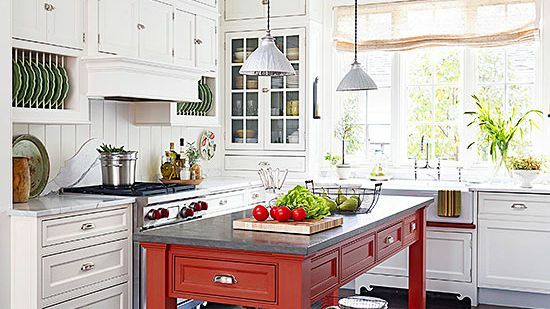 Painted cabinets and a vintage table complement the warm red with their shades of gray. Artwork in square, black frames offers a soft contemporary element to the hardworking kitchen. 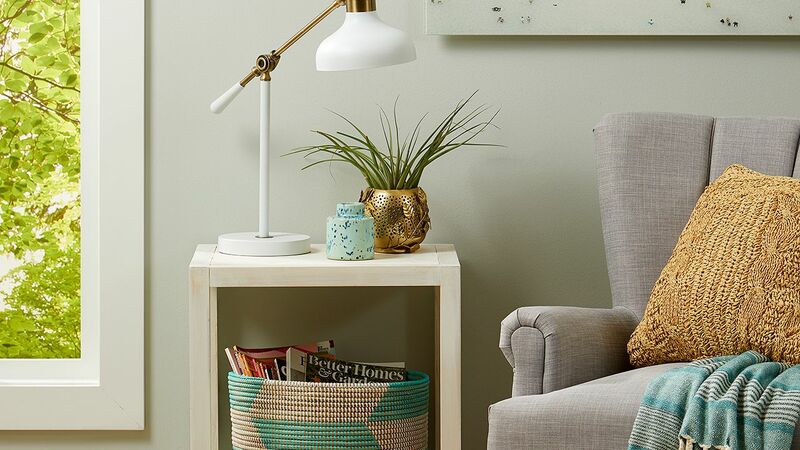 A heavy orange crock, green cake stand, and wooden cutting board maintain the casual tone. Paying homage to every kid’s favorite hero -- whether fireman or comic fantasy -- this room is definitely one of the good guys. 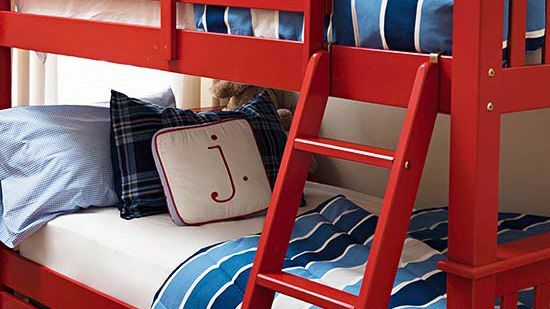 Unapologetically themed, the red-painted furniture and blue-stripe coverlets sing with patriotism. Framed comics add even more super powers to the winning combination. A built-in buffet showcases cabinets in two shades of red and two different cabinet styles. 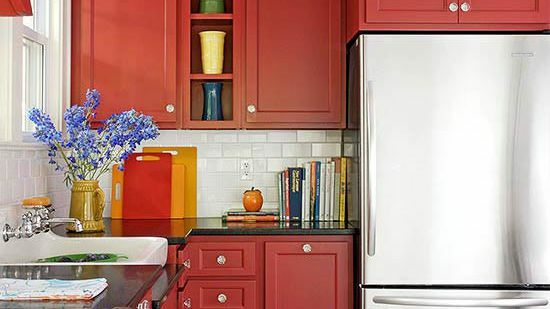 Lower cabinets are a bright shade of red with vertical lines. Upper cabinets are dark maroon with clear-glass panels and thick crown molding. 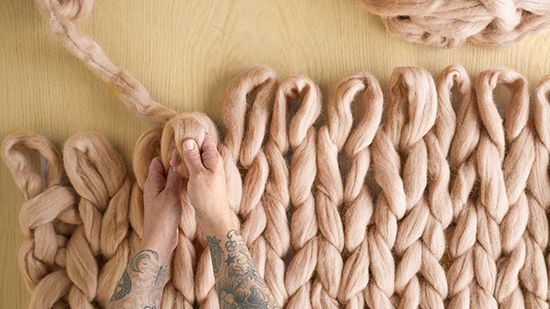 Varying the intensity of a color adds depth and interest. For more character, an advertising poster in yellow and green is centered between cabinets. Red and white stripes offer a cabana feel to a rattan armchair. 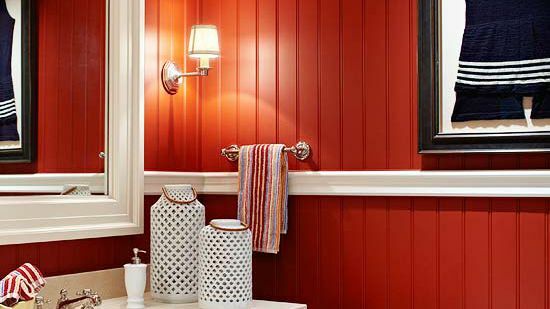 Red beaded-board walls and a framed vintage navy swimsuit in this bathroom bring to mind weekends on Cape Cod. 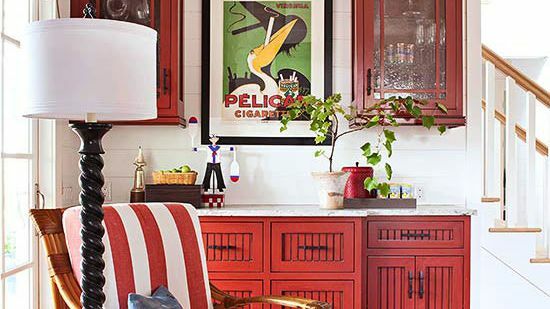 Set against a simple white vanity with a framed mirror, the color combination of red, white, and blue suggests an all-American beach-side retreat. Oxblood, a deep burgundy red, is a fashionable take on classic red. 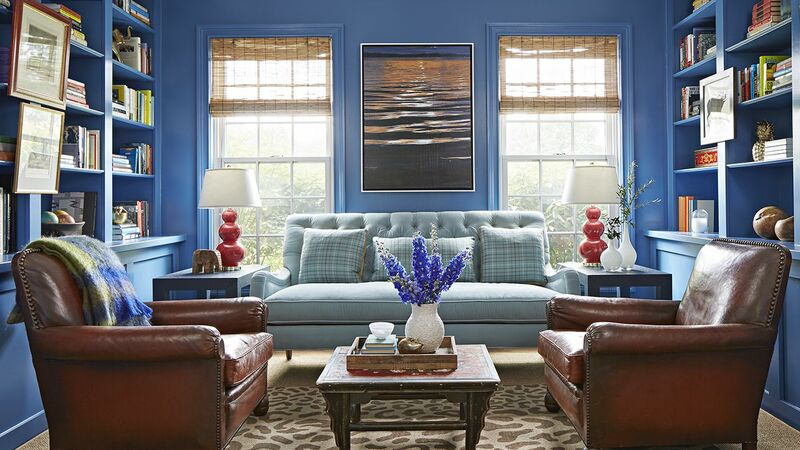 Favored on fall and winter runways, this decadent hue mixes well with blue, another primary color on the wheel. 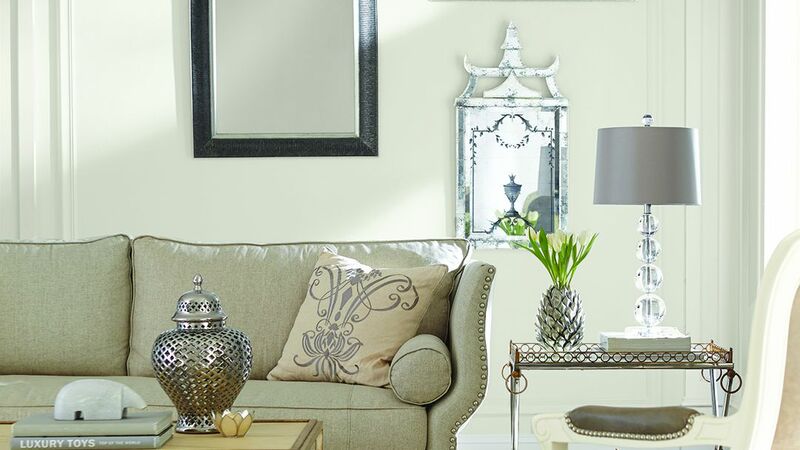 A white sofa adds to the cold weather scheme -- illuminating the dark like fallen snow. 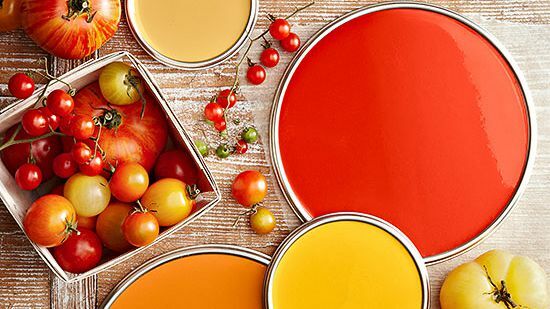 Adjacent to each other on the color wheel, orange and red are natural companions. 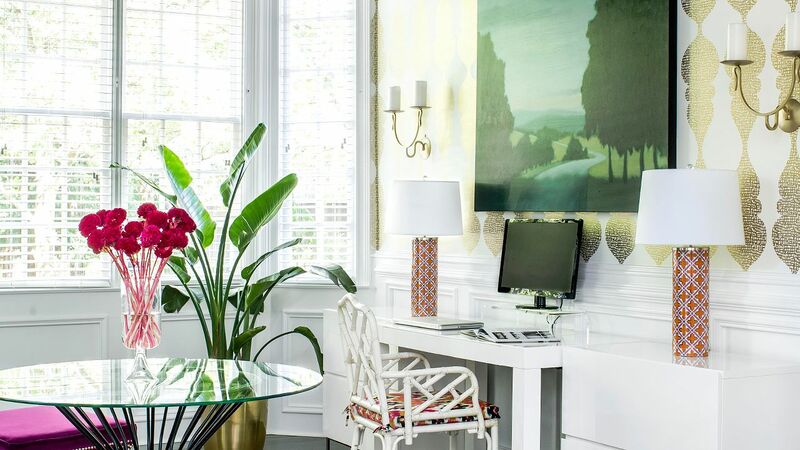 Here they mingle in artwork and decor coloring a contemporary setting. Natural, plank wood walls and streamline cabinetry give the room the aura of a modern wooded hideaway. 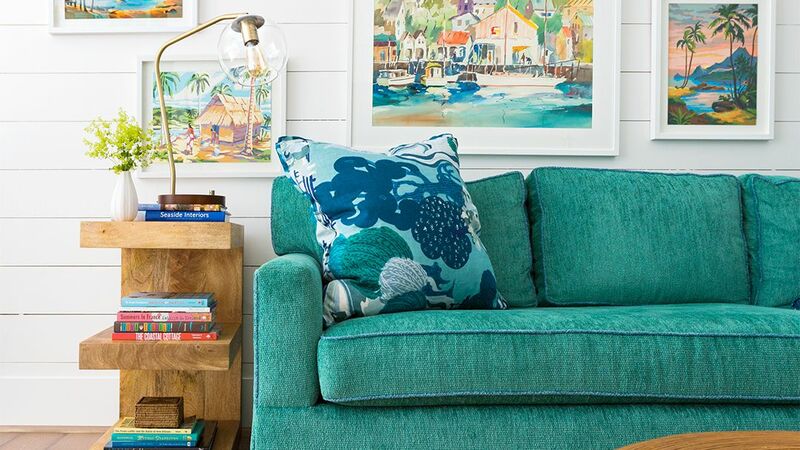 A chocolate brown chair and ottoman with caramel undertones maintain the cabin vibe. Like a perfectly-blended fruit punch, this kitchen is as sweet as a sun-ripened strawberry with just enough of a tart bite from a green apple. Like all complementary colors (opposite each other on the color wheel), this red and green combination makes the opposite color seem even more vibrant. The room offers other similar plays on design. The disparate surfaces of smooth stainless steel and rough hewn wood seem even more exaggerated. 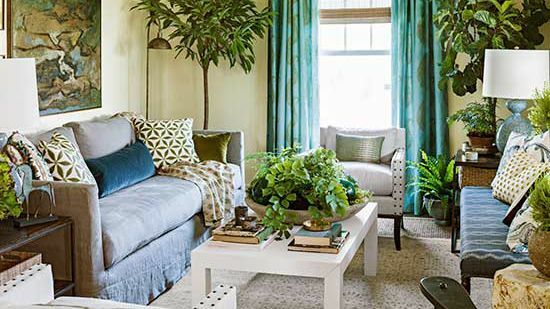 Like the comfort and familiarity of a favorite childhood toy, this cozy living room offers an invitation to enjoy a leisurely afternoon. 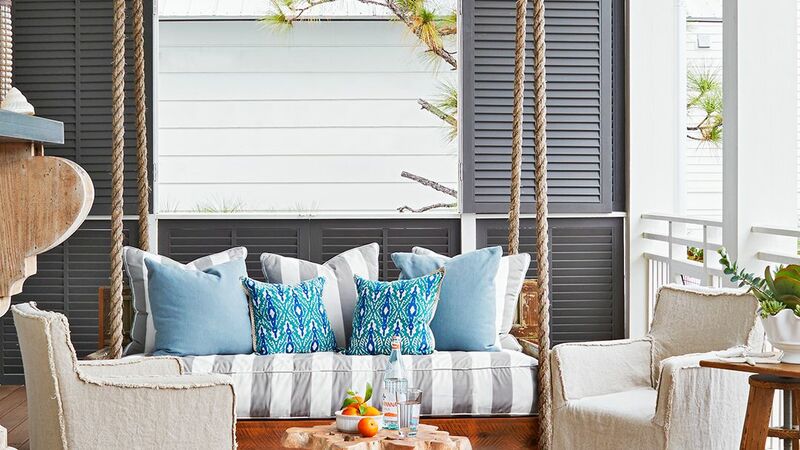 The friendly vibe of the casual, red stripe pillows underscores the welcoming interior of this cottage-style home. 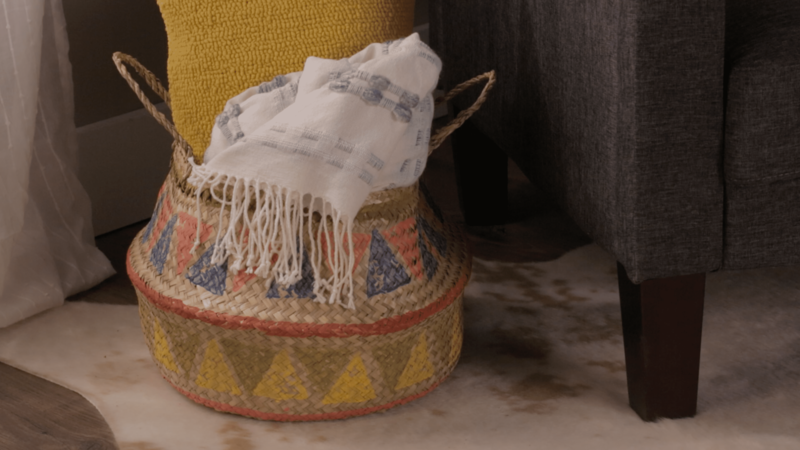 Slipcovers and easy woven pieces such as the rattan chairs, sisal rug, and matchstick blinds create a soothing, neutral backdrop. Enhanced by color choices and finishes, this upscale cottage kitchen displays fine furniture details. 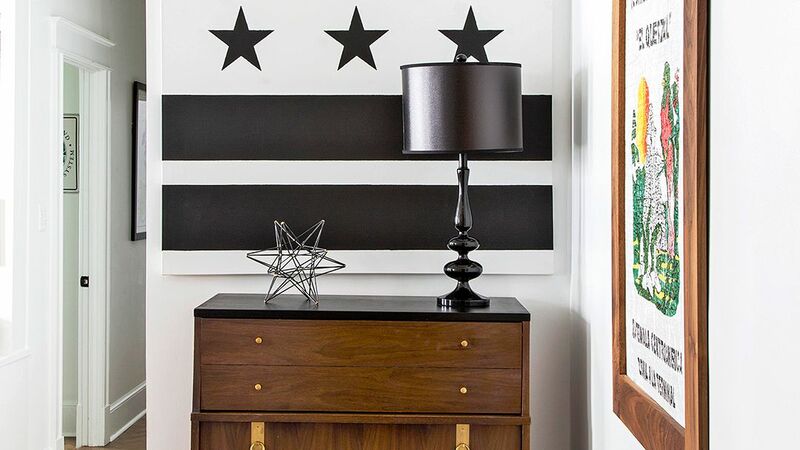 The built-in hutch is a standout flanked by windows and black Roman shades. A black stone surface and scrolled backsplash mimics curves in the cabinetry. On the island, turned legs receive more notice with their layered hand-rubbed finish and coral red undertones, which mimic the accent breakfront.